A company of the German Schutztruppe on the march. 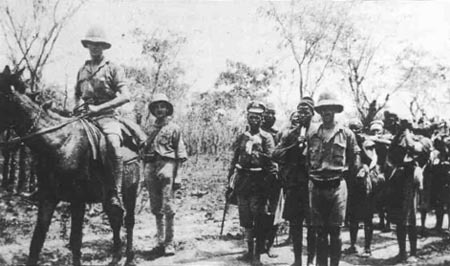 East Africa: Lettow decides to concentrate 20 companies (2 mounted) against South African advance, leaving Kraut to face Smuts and Wahle against NRFF (Nyasaland-Rhodesia Field Force) and the Belgians. Verdun: General Knobelsdorf moves doubting German east bank commander Mudra back (Lochow replaces) to his Argonne corps and resists Crown Prince’s doubts same day. Trentino: West of Lake Garda Alpini capture Crozzon di Fargorida with Lares and Cavento Passes, but Austrians cling to Fargorida Pass.